Home » EPDC Data Points » How do you measure the number of out of school children? For this set of countries, the (unweighted) average difference between OOSC rates from survey and administrative sources is 7 percentage points. Out of school rates from household surveys were higher than those from UIS administrative sources in most (12 of 17) countries. Survey and administrative figures differ by over 20 percentage points in Ethiopia and Mauritania, meaning that the sources tell very different stories of school participation in those countries. The differences apparent in the chart translate into large disparities in estimated numbers of out of school children in each country. In India, for example, the 11 point discrepancy between 2006 Demographic and Household Survey (DHS) and same year UIS figures amounts to an additional 14.6 million children out of school. In Ethiopia, the 20 point discrepancy between the 2011 DHS and same year UIS figures means that OOSC estimates fluctuate by 2.9 million children depending on the source used. 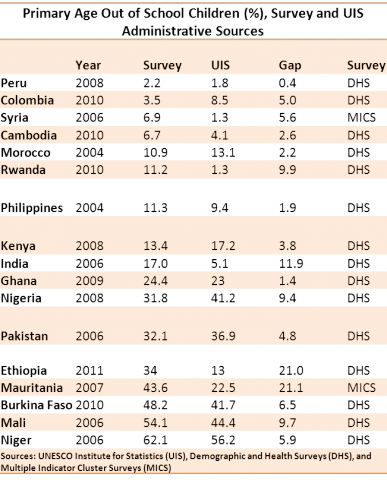 These dramatic variations in estimates impact our understanding of the scope of the out of school issue around the world and necessitate a closer look at data sources, which vary in their measurement of school participation (attendance in surveys versus enrollment in administrative sources) and by which school systems and subpopulations are measured. EPDC is working to highlight and build upon research in these areas from UIS 2005 and 2010 publications in order to bring attention to the challenges of measuring school participation. UIS [UNESCO Institute for Statistics]. 2005. Children out of school: Measuring exclusion from primary education. Montreal, UIS. ; UIS [UNESCO Institute for Statistics]. 2010. Measuring educational participation: Analysis of data quality and methodology based on ten studies. Montreal, UIS. Household survey and UIS administrative figures use the primary cycle defined for each country in the International Standard Classification of Education (ISCED). How can researchers account for discrepancies between sources when they arise? Should researchers try to standardize the way that out of school children are measured? If so, which indicator should be used: attendance rates, enrollment rates, or a hybrid of the two?